You've reached the Northern Ireland Adventureland Blog for 2013 but don't worry this fantastic weekend of half price and discounted events is back for 2015. Check out our Northern Ireland Adventureland Weekend family blog for 2015 for a whole host of fantastic family events happening on Sat 28th & Sun 29th March 2015. If you’ve always wanted to do something different in the outdoors with the kids but didn’t know where to start then Northern Ireland Adventureland Weekend is the perfect introduction to what’s on offer in Northern Ireland’s great outdoors. For one weekend only on Saturday 23rd and Sunday 24th March a whole host of adventure activities are being offered for just £10 and a massive 50% off normal prices meaning you can have a fantastic day out without breaking the bank. Swing from the tree tops on a high ropes course, explore the coast on a sea safari, paddle the waters in a canoe, surf the waves or have a splash wet bouldering all whilst in the capable hands of expert instructors helping to create a safe and fun environment. The best part about Northern Ireland Adventureland Weekend is that it is hassle free – simply choose from one of the many activities on offer and book online. All that is left for you to do is turn up on the day and have some fun - it couldn’t be easier! Using a variety of boats - Canadian canoes and sit-on-top kayaks that are easy and fun to paddle experienced instructors will show you a few of the basic strokes before heading off for a paddle under the watchful eye of St Patrick towards the Quoile Barrier. Look out for the seals as you make your way to the pier for a fun jump into the sea! Wet bouldering is all about the water – make your way up a river, jump into pools and climb up waterfalls on this wet and wild experience all under the supervision of fully qualified instructors. This is one experience the kids won’t forget! The latest craze to hit the shores of Northern Ireland, Stand Up Paddle Boarding (SUP) is a fun and easy way of riding a surf board on flat water with a paddle. Experienced instructors will teach you the basics to get you up ‘SUPing’ in no time. Enjoy the most extensive off-road trekking facilities in Co. Antrim. Whether you’re a total beginner or a confident rider, experience the freedom, fun and buzz of horse riding in a stunning setting. Feel the wind in your hair as you leave Ballycastle Harbour behind and take in the beautiful cliffs of the North Coast before reaching Carrick-a-Rede Rope Bridge and Rathlin Island on board Aquaholic's thrilling high speed Rigid Inflatable Boat (RIB). Enjoy an adventurous morning or afternoon's paddle along the beautiful River Roe with Binevenagh as a back drop. With experienced instructors to show you the ropes everyone is sure to have a splashing good time. Experience sailing in the shadow of the Titanic building before enjoying a blast along the water in a powerboat. Get set for an exciting, fun taster session incorporating archery, a 500 metre zip line and a high speed hill rally stage - this is by no means an ordinary family day out! Experience the best of both – archery and laser clay pigeon shooting. Test your skill and coordination in a fun, relaxed family atmosphere. With junior bows available for ages 8 and up your never too young (or old) to play robin hood! Learn how to enjoy biking round the UK City of Culture safely with your family. Explore the historic landmarks such as the Peace Bridge and famous City Walls whilst learning how to negotiate steps and curbs along the way. Jump into a wetsuit and grab a surf board to experience a thrill the whole family can enjoy. A surf lesson aimed at all ages to learn the skills and techniques needed to ride the waves. Drive the karts around Superdrive’s outdoor track and race against your friends and family to find out who has the potential to become the next Lewis Hamilton. You've reached our 2013 Valentine's Day Blog make sure to check out the new 2014 blog 'Give the Gift of Adventure This Valentine's Day' for plenty of unique and exciting gift ideas to give your loved one this year. Nothing says romance like spontaneity so this Valentine’s Day why not surprise your loved one with an amorous adventure?! Whether you are a thrill-seeking couple or simply looking to do something different together an OutdoorNI.com Gift Experience is the perfect Valentine’s Day present. All gift vouchers are posted first class delivery the next day but if you’ve left it to the last minute don’t panic you will receive an e-voucher as soon as you have purchased your voucher online with the hard copy to follow in the post. A minibreak with a difference spend the night under the stars in quirky new camping pods and experience the great outdoors without having to put up a tent! With bike hire included it will then be time to hit the trails at Castle Ward, the fun doesn’t stop there however as the voucher also includes an archery or canoeing session – it’s quite literally the gift that keeps on giving! Enjoy a fantastic boat tour around the fabulous North Coast and Rathlin Island as you take in the sights from the sea including the Giant’s Causeway, the Skerries, the historic Dunluce Castle and much more! The perfect combination of adrenaline and relaxation! This experience includes 2 zorbing rolls where you will both climb inside a giant inflatable ball and hurtle at high speeds down a hill as well as a session in the Jungle NI’s outdoor hot tubs. 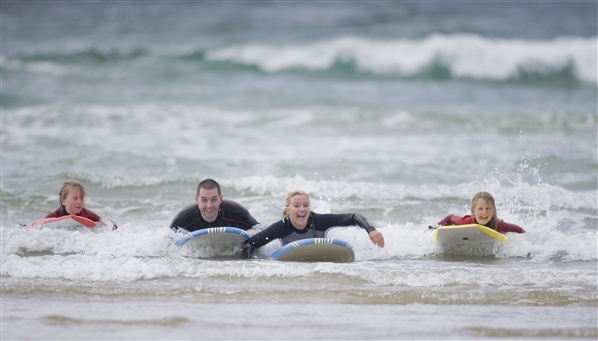 Learn all the basic skills needed to paddle, pop up and surf the waves right to the sandy shore of Benone Beach. Your expert instructor will coach you both from the very beginning and show you all the skills you need to ride a wave. You don’t have to go on a romantic holiday to Mauritius to experience scuba diving.This three hour session includes a safety briefing and instruction from a fully qualified PADI instructor and is sure to be one experience you will never forget!